A detainee in solitary at the Northwest Detention Center in Tacoma. Immigration detention is a booming business in the U.S., mostly run by private, for-profit contractors. A new bill in Congress aims to phase out these private facilities, including the Northwest Detention Center in Tacoma. “One thing I am 100 percent confident of is that there is a cheaper, more humane way to treat the undocumented population in our country,” said Rep. Adam Smith (D-Washington). On Tuesday, Smith and Rep. Pramila Jayapal (D-Washington) plan to introduce legislation that calls for an overhaul of the immigration detention system. Currently, 90 percent of federal detention is outsourced to private contractors or local jails and the regulations vary from place to place. The legislation calls for the Department of Homeland Security to take over ownership and operation of all detention facilities within three years. The bill, called the Dignity for Detained Immigrants Act, would also create higher standards at detention centers – standards for medical care, legal services, and basic living conditions, among other things. 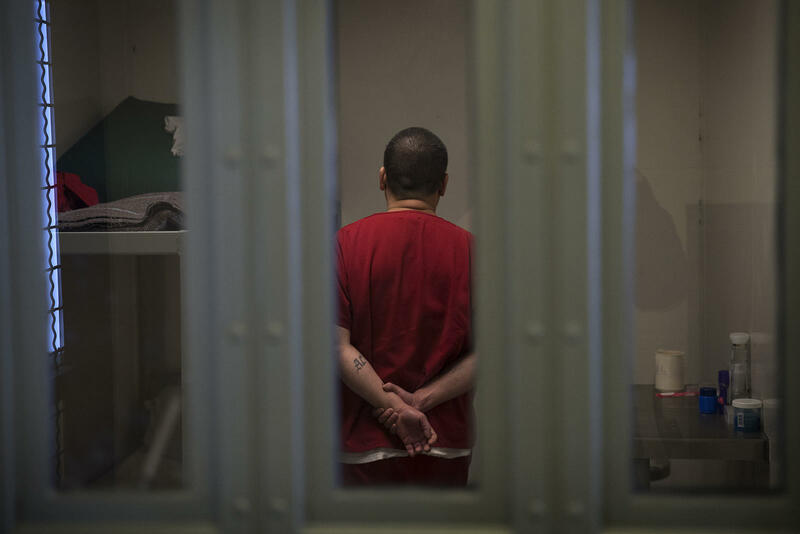 A recent series of detainee hunger strikes have called attention to these issues at the Northwest Detention Center in Tacoma and at other immigration jails around the country. More than 350,000 people were held in detention last year, and the 2018 federal budget projects a 70 percent increase. “The bottom line concern is that detention facilities are not regulated by the federal government in the same way that federal prisons are,” Smith said. Former Homeland Security Secretary John Kelley defended the standards while testifying to Congress in May. “ICE detention standards are well beyond the standards that even the Federal Bureau of Prisons has in terms of prisoner….housing and care,” Kelly said. An Immigration and Customs Enforcement (ICE) spokesperson declined to comment on pending legislation, but information on the agency’s website describes an ongoing rollout of new standards to all of its facilities. However, some facilities are still using standards that have not been updated since 2000. In 2016, a Homeland Security advisory subcommittee reviewed the use of private immigration detention facilities and evaluated whether this practice should be eliminated. The report compared private facilities to those run by ICE and found private facilities are cheaper to run and necessary to meet capacity demands. However, the committee ultimately recommended a shift away from these for-profit jails. According to the report, the average cost of a day in an ICE-run facility is $184.35 per person versus $144.23 in a privately-contracted detention facility. Yet Jayapal said the proposed legislation would ultimately lead to cost savings, since it carves out limits on who can be detained and for how long. For example, the bill would create a category of “vulnerable persons,” including pregnant women and primary caregivers, who could qualify for alternative community supervision programs instead of detention. Smith said he’s not naïve. He knows how Congress works. And he knows it’s a longshot to even get a hearing on this bill, given the Trump Administration’s crackdown on illegal immigration.